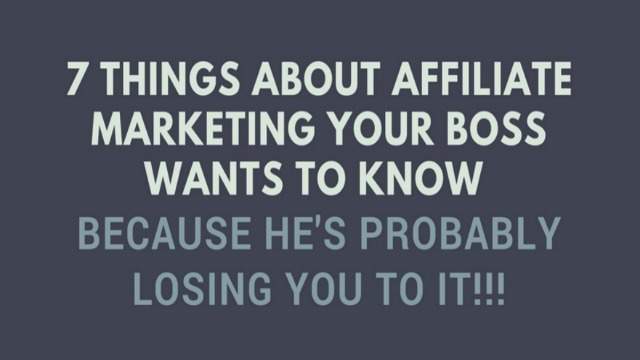 » 7 Things about Affiliate Marketing Your Boss Wants to Know! 7 Things about Affiliate Marketing Your Boss Wants to Know! What if your boss knew that you were about to blow the doors off of your online business and achieve massive success…ON YOUR OWN! I recently read a fantastic article over on horkeyhandbook.com by Mickey Gast called ” How to Get Started with Affiliate Marketing.” I thought the article was really relevant heading into 2017 here and it was worthy of your time and attention. I was inspired buy Mickey’s article to do this small infographic that sort of summarizes some of the info in the article. Love this post? Share it and Grab your free copy of 50 Ways to Flood Your Website with Targeted Traffic!